Many game anglers who regularly fish from the banks of reservoirs put their rods away in October: the cold days, fierce winds and sparse hatches can make fishing difficult and very frustrating. Memories of browns and rainbows rising freely during the warm, summer evenings linger and surely test, if not altogether undermine, their patience. Farmoor was designed with anglers in mind. The sloping concrete banks have ridges to help secure your footing when you cast. 1. This is a widely used retrieve. First grasp the line with your thumb and index finger; ensure the line lies in your hand. 2. Lift your wrist up slightly, bringing your middle finger, ring finger and pinky towards the backing or flyline 3. Trap the line and pull it into your hand. Then reach with your thumb and index finger to grasp it again, making a cycle. A handsome bar of silver – this rainbow, with the Booby still in its mouth, is about average for Farmoor. Under a clear, bright sky Harry plays yet another rainbow trout. 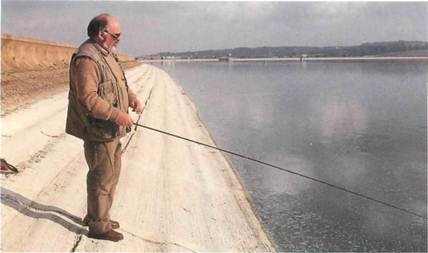 One of the commonest problems when fishing with Boobies is that the angler doesn’t wait until the line has sunk all the way to the bottom. In cold water the lure should fish directly along the bottom. If you use it in mid water, it won’t be as effective. He soon brings out his extension net, and the trout is safely stowed. Though not one of the bigger trout which Harry caught, this stock fish is in fine condition. There are good and not so good times to use Boobies. 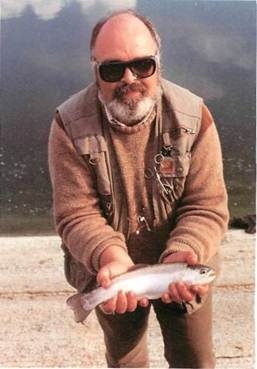 Generally, a good time to use one is early and late in the season when the water is cold and trout are hard along the bottom in very deep water. It’s usually not a good idea to use a Booby from June to early September when the fish are more often in the upper layers of the water. If you aren’t catching and you’ve tried many colours of Boobies, you may want to vary your retrieval speeds – from very slow to medium-paced figure-of-eight to a fast, hand over hand continuous draw. Harry poses with a full bag – , all taken with various coloured Boobies. By car: Farmoor Reservoir is just west of Oxford. From the A34 there are many ways of getting there. Take the A420 and drive until you reach the B4017 (Cumnor Road). Turn right, and you’ll end up at the reservoir. 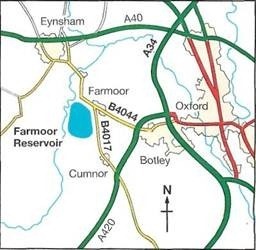 Alternatively, go eastwards on the A40 until you reach the B4044 which goes into Farmoor. From there follow the B4017 (Cumnor Road) south. The reservoir is clearly signposted. For this time of year you need special tactics – often ones which are not typical and which hurl anglers into brawls about ‘right’ and ‘wrong’ ways to catch trout. Harry, however, isn’t interested in time-consuming debates today: he aims to catch trout on Farmoor II, not talk about catching trout. A big pile-up on the A34 and thick fog mean that we’re behind schedule. But starting too early often proves futile when the water has amount of casting involved – two back casts are all you need to punch out a fly 30m (33yd). And best of all you finish the day relatively fresh, not overly tired. A heavy line also holds the bottom better than a light line (which tends to ride up in the water). This style of fishing isn’t for dry fly purists who fish the untouched chalk streams for wild brown trout with a size 18 Lunn’s Particular. Nope. Harry hurls a vivid pink Booby – birdlike in appearance, except for the missing bill – skywards; his line lands in a heap, dragging the wobbly, bubbly-eyed bird downwards to the silty bottom. Boobies are thought to suggest coarse fry such as roach, bream, perch and pike (all of which are found in Farmoor II). Both rainbows and browns are stocking up for the lean months of winter just around the corner. Small coarse fish are a priority on their list. A bellyful of these on a regular basis, most trout would agree, is due consolation for living in the cold autumnal water. Harry casts about 30m (33yd) and sets his rod down. He crosses his arms and waits. He sits on his tackle box and waits. He lights a cigarette and waits. He waits and waits – up to five minutes – to ensure that the Hi-D line is lying along the bottom (7.6m/25ft deep). If you don’t give the line enough time to sink before you retrieve, the lure fishes in mid water – where there are no trout. You’ve got to allow the line to sink – even if it means handcuffing yourself to the wall or wearing a straitjacket! The fog thins, receding upwards and making it much brighter – though it’s still cold (7°C/45°F). From vivid pink to white to bright orange to black – Harry changes Boobies all the time, experimenting to find out what the fish want. Suddenly his rod springs to life. The take was so violent that the braided backing (attached to the shooting head) cuts into Harry’s fingers — a price he’s more than willing to pay for hooking a trout. 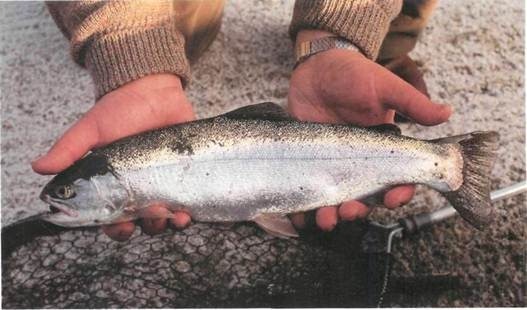 Soon the beaten rainbow – a small one, dead on a pound (0.45kg) – glides into the net. As expected, the Booby is deep inside the young trout’s mouth, but Harry dislodges the hook with typical matchman’s speed and efficiency. He used to be a keen coarse angler, competing regularly in matches. He started fly fishing in 1976 simply because there was less travelling involved and because it didn’t consume all his free time. He decided to ‘give fly fishing a chance’. On his first trip out he caught a few trout and thought it was a doddle – but soon learned that it wasn’t going to be easy to get a good weight on every trip. A little later Harry lands two more rainbows – both of which tip the scales at about 1 lb (0.7kg). We head to the west side of the reservoir where Harry attaches a black Booby with a fluorescent green tag. The wind is blowing from left to right (ideal for right-handed casters). Again with only two back casts, he sends the fly about 30m (33yd) out – much farther than any of the other anglers fishing along the shore. As he’s retrieving, he gets a brief but solid take. Undaunted, he continues to retrieve. Four pulls later the Booby convinces the fish. And another rainbow puts on an acrobatic show on the surface of the water before being netted. 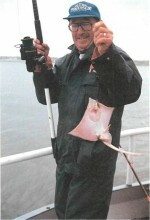 Harry’s Boobies are tied on short shank hooks, not the standard long shank ones, simply because the hookpoint is closer to the Plastazote eyes to increase the potential of hooking an eye-nipping trout. With four fish and about eight takes which weren’t converted to solid hook-ups, Harry’s doing well compared with the other anglers along the bank who have but one or two fish so far. But he’s not getting takes so regularly now. The absence of cloud cover, combined with the calm, flat water, may have something to do with this. The foraging rainbows have retreated to deeper water. Harry’s caught one more rainbow. 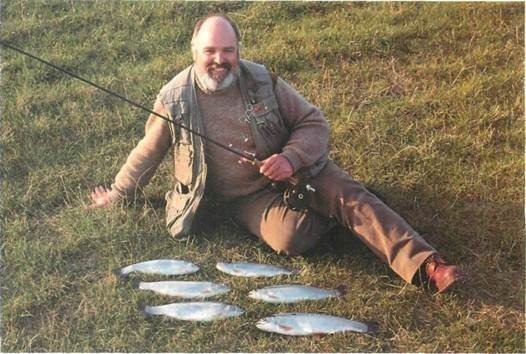 Though the trout have come in along the bottom again, he’s having to change Boobies every three to four casts. ‘The trout just don’t want to see the same colour too many times,’ he says. Using ‘standard’ bank-fishing gear (WF7 line and middle-to-tip action rod), other anglers are struggling to get good distances. Many arm-wrenching attempts produce only 20m (22yd) casts. Harry picks up a good fish about 30m (33yd) out directly on the bottom. 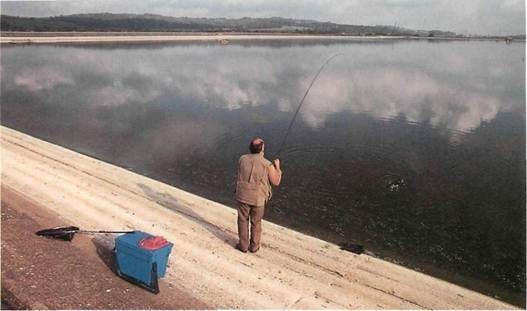 There’s a healthy bend in his rod – it looks as if this is going to be a good trout, judging from the amount of line it’s taking. He has a job to try and winch the fish upwards. But it refuses to give ground, surging out to even deeper water. Slowly he forces it towards the bank, but he has to give it line every time it makes a demand. Soon out comes the net, up moves the rod and in goes a cracking 2 1/2 lb (1.2kg) rainbow trout: number six – a full house. The traditionalists would scoff but go away Ashless – oh, all right, with one trout. October is the time for Boobies. 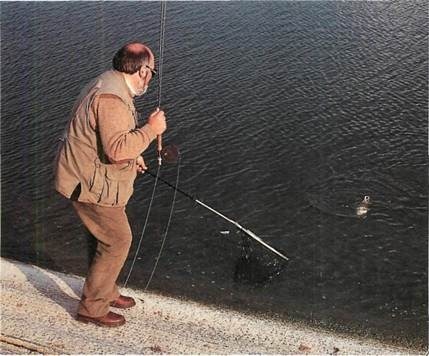 During other times of the year – especially from June to September – Harry is one of the first to admit that to fish a Booby is a bad mistake, for the trout are in the upper water layers and other methods are more effective. Fishing midges and nymphs on a long leader with floating line is the way to go from the shore. There are times when you should use nymphs and midges, and there are times when Boobies are better. In the early and late season when the trout are on or near the bottom of the reservoir in deep, warmer water, you can’t beat a bubbly-eyed Booby. Harry Bewick couldn’t agree more.